In Episode #9, Mary Pat answers one of the questions she gets most often on the site: Can You Charge Patients a Fee for Payment Plans? When I first heard about SMAC I thought they were a collection agency. But SMAC is not a collection agency in the traditional sense and I interviewed President Samara Keaton to find out what exactly SMAC is. 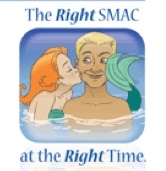 Manage My Practice: SMAC’s ad on Manage My Practice features a mermaid alternately kissing and smacking a handsome young man. What’s going on there? Samara: We thought the SMAC (kiss or slap) approach to patient balance recovery was very appropriate. You love your patients, but sometimes you have to bring them a dose of reality – that there is a balance due for a service they received. Manage My Practice: If you’re not a collections agency, what are you? Samara: SMAC is the solution to the ever-present anxiety in healthcare over sending patients to collections. No one wants to send patients to collections, so we work with and help patients who want to pay. SMAC is a patient balance recovery company, and we do what you would do if you had unlimited resources to manage your patient collections. Manage My Practice: And what is that? Manage My Practice: What is SMAC’s collection approach? Samara: We believe that every account has a story. We want to hear that story and help patients who want to pay make the payment or set up a payment plan. We resolve every account every time, which means that either the account is paid or SMAC is making a recommendation for credit impairment or legal action. It is the practice’s decision at that point. Manage My Practice: When are accounts transferred to SMAC? Samara: Most clients end up transferring accounts to us at around 61 days, but this is totally flexible. We can take accounts as soon as insurance pays and the patient balance is established, or we can take them after your in-house collections program has worked them, or we can take them when you want to impair credit or take legal action. 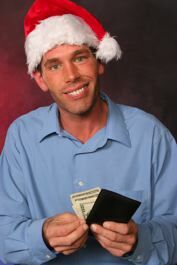 Regardless of when you give us the account, we pay the practice $.50 for each account, then the practice recoups 70-80% upon collection of the account. Manage My Practice: My memory of working with a third-party collections agency is the confusion over the patient payments at the practice and who owes whom what. How do you handle payments? Samara: Patients can make payments to the practice or to SMAC. All payments are logged to an online account which shows who owes money to whom. SMAC makes payments to the practice/hospital weekly. Manage My Practice: Your site says “Doctor Directed, Administrator Approved, Patient Preferred.” What does that mean? Samara: It means that the physicians set the course for collections activity they are comfortable with, administrators approve the work of the SMAC collectors, and the patients prefer speaking to someone who can interpret the account activity to explain the reason why the balance is owed. Manage My Practice: Why have patient collections become so important in healthcare? Samara: In the past, the patient balances relative to the overall A/R balance of a medical practice was a much smaller number than it is today. Medical practitioners were conditioned to live off of co-pays and whatever they could get from the insurance companies, and tended to ignore and/or write off the unpaid patient balances. Today, Physicians have come to realize that they can no longer simply write-off the unpaid patient balances and expect to stay in business. 80% of the physicians interviewed said the A/R portion of their overall receivables has gone up more than 12% in the last 5 years. We expect this trend to continue as patients are moving more and more to catastrophic plans with $5,000 to $10,000 deductibles. Therefore, there could be an even greater shift in the revenue stream in the near future. Manage My Practice: How can readers get in touch with you? Samara: We invite medical practices, hospitals, billing companies and consultants to a very short (10-minute) demo of what SMAC can do. Contact us at 1-888-531-6406 or schedule an online demo here. Disclosure: SMAC has paid a sponsorship fee to advertise on Manage My Practice. Sponsors are chosen for this blog based on usefulness to readers, product quality and authenticity. Patient Collection Question #1: How Do I Know What to Collect at Check-Out? My book on front-end collections has been doing really well and I’m pleased that a number of people have called me or emailed me with questions. Here’s one question that a number of people have asked – “Can you tell me more about knowing what to collect from the patient at check-out”? Hopefully, you have followed my advice and collected co-pays and previous balances before the visit. The portion that you collect after the visit is the co-insurance and the deductible. The guideline on collecting after the visit is directly related to the allowables on the services the patient received. 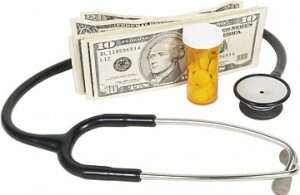 Allowables are the amount that payers consider payment in full. Of the total allowable, a portion will come from the payer and the balance will come from the patient. Knowing that percentage is the secret to collecting at the check-out desk. The percentage of the allowable that the patient will pay is the critical piece of information you need to successfully and accurately collect after the visit. The Medicare allowable for your area of the country, or state, for the current year. If you participate with Medicare, you have an allowable, if you do not participate with Medicare, you have a limiting charge that you must use for Medicare patients. The allowables for the payers with whom you have contracts and have agreed to accept their rate for their subscribers. The rates paid by payers with whom you do not have a contract. Their payment for out-of-network services (non-contracted physicians) will determine the amount owed by the patient. Medicare allowables are published every year, both in the federal register and online at the CMS (Centers for Medicare and Medicaid) website. If you are fortunate enough to have a practice management system that loads this information automatically for you, you are golden. If not, you will need to enter these manually. The good news is that very few practices need to add more than 50 – 100 allowables to get started. You can also use a paper cheat sheet to fill in your top 50 – 100 codes. Make a chart with your fee, the Medicare allowable, and the 20% of the allowable that Medicare patients must pay at every visit. A note of caution – many Medicare patients have secondary coverage and it can be difficult to know what the secondary coverage will pay. Most practices will not collect anything for patients with secondary coverage because it can mean a lot of refunds have to be written when the secondary payments come in. If you have a contract with a payer, they must furnish you with a full allowable fee schedule, or with an payment model. For example, their payment model may be 150% of the 2007 Medicare schedule. You will need to go to the CMS lookup page here and get these allowables for your services for 2007 and multiply it out. If the payer is paying 150% of that allowable, it will be $85.47, and if the patient has to pay 20% of that allowable, they will owe $17.09. Don’t forget to include the deductible in this equation, as the patient will need to satisfy the deductible before the payer will pay you 80% of their allowable. Some practice management systems will have the ability to take that information and calculate it for you, so be sure to ask your vendor about this before you do the work. If you are constructing a manual cheat sheet, you’ll have your fee (even though it doesn’t come into play, I suggest practices always keep their fee on cheat sheets, so staff can bring anything unusual to the administrator’s attention. Also as you increase fees, you have a handy visual.) Add the payer’s allowable, and calculate the percentage the patient will owe. Use this same sheet for your payment posters to make sure you are getting paid the correct amount if your practice management system doesn’t do this for you. By the way, if an insurance company that you have contracted with refuses to give you a schedule of allowables or a payment model, contact your state medical society, your state insurance commisioner, or your state legislators for help. Collect a deposit based on the total charge. Let the patient know it is an estimate and that more or less may be owed. I do not believe in sending statements. In my book I recommend using a payment portal to securely store patient credit cards, and adjust the remaining balance up or down according to the actual payment. As payments come in you can develop a knowledge base for what different payers and plans will pay. This will assist you in estimating the patient’s portion more accurately over time. You can give patients information about the services they most likely will receive at their visit and ask them to call their payer and get information on payment. This is a great strategy. If patients are shocked about their portion, they may want to reconsider becoming your patient. The last thing you want is a patient who is surprised by the payment due after they have received the services. Some payers supply subscribers with allowable information on their website. You can usually get the allowable information by phone if you have the subscriber’s information, or if you have the subscriber on a three-way conference call, or in the room with you. This is more typically done when the subscriber is contemplating surgery or an expensive procedure and you are working on a payment plan, or outside financing with them. Knowing what the patient owes and making arrangements for payment in full at time of service is one of the most significant things you can do to increase your receipts and decrease your accounts receivable. No practice can afford to “wait and see what insurance pays” and bill the patient months after the service has been rendered. I took last week off to complete a project I’ve been working on since early this year – my first book! It’s really a workbook and it guides the reader through a program to move their practice from a back-end collection process to a front-end collection process. What is the difference? A back-end program collects the majority of patient-owed balances after the payer has adjudicated the claim and has submitted payment to the practice. A front-end program takes all the available information about the payer/plan and collects payment or arranges future electronic payments with the patient at the time of service. You really can implement a program like this in your practice. It’s hard work, but well worth the effort.